PCH, Budget Engine Swap Edition: Chevy V8 RX-7 or Nissan V6 Corona? Welcome to Project Car Hell, where you choose your eternity by selecting the project that's the coolest... and the most hellish! Last time around, we saw the beat-to-hell Dodge Colt Turbo take the win over the totally trashed Chevy Sprint Turbo in the Choose Your Eternity poll. That's great, but what if you want a cheap Japanese car that doesn't rely on turbocharging to give you the power needed to set your town's all-time record for Exhibition Of Speed tickets issued in a single week? You'll need to go the engine swap route, of course, and everyone knows the best way to do an engine swap is to take on someone else's partly-finished project! See, that way someone else screws up performs the dirty, sweaty part of obtaining the engine and getting it into the recipient car's engine compartment, leaving only thousands of a few maddeningly difficult easy tasks remaining to complete the job. Putting a Detroit pushrod V8 into a Mazda RX-7 is a pretty common swap, and there are some really nice ones out there. Sure, the new engine weighs about 16 tons more than the original rotary did, but it also makes approximately 16,000 times as much torque. The Ford small-block is the preferred engine for such swaps, since it's smaller and lighter than its Chevy and Chrysler counterparts, but sometimes you see such a great deal on a used engine that you have no choice but to buy it. We're pretty sure that's what happened with this '87 Mazda RX-7 (go here if the ad disappears), which has a Chevy L98 engine and 700R4 already installed. All you need to do is get a radiator and driveshaft and, you know, a few other minor details. Should be easy! You get a Painless wiring harness (though we see what looks like painful clusters of sliced wires a-dangling) and an "ECU for 350," and the whole deal is a mere two grand!Thanks to Radiohound for the tip. An L98 RX-7 would be pretty quick, but wouldn't you prefer to go vintage if you're going to drive an engine-upgraded Japanese car? We couldn't find a Toyopet with Cadillac 500 engine, but how about a late-60s Corona with a lightweight, high-revving Nissan V6? Not only that, how about one for less than half the price of the V8 RX-7? It seems hard to believe, but this 1968 Toyota Corona with Nissan 3.0 V6 engine (go here if the ad disappears) is priced at only $900. Not even four figures! We don't want to hear any complaints about the seller neglecting to identify what kind of 3.0 liter Nissan V6 engine got dropped into this car, not at that bargain-basement price! 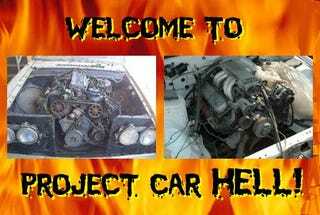 You get a harness (which may be from the donor car) and some "JDM headers," and the seller- apparently not believing that the car's photographs tell the whole story- adds "Project Car needs to be finished." Is there a transmission or driveshaft? We don't know. Was the engine known to be running before it was torn out by the roots and wedged into the Corona's engine compartment? Maybe. Come on, it's cheap! Thanks to LTDScott for the tip.